The total route length of 10.8 kilometre will have 12 stations — Shastri Park, Kailash Nagar, Gandhi Nagar, Taj Enclave, Geeta Colony, Guru Angad Nagar, Scope Tower, Ganesh Nagar, Mother Diary, Patparganj, Kotla and Trilokpuri. The route will integrate with three Delhi Metro lines – Shastri Park Metro station on Dilshad Garden to Rithala line, Nirman Vihar Metro station on Anand Vihar to Dwarka line and Trilokpuri Metro station on Mukundpur to Yamuna Vihar under-construction line and provide inter-change facility. “It is expected that initially monorail in east Delhi will have a daily ridership of around 1.5 lakh. The elevated monorail will supplement the existing intercity transport mode, including Delhi Metro,” said the official. Besides Mono Rail, the Delhi Government has also proposed to construct three corridors of Light Rail Transit, covering a 45-km length in Phase 1. The feasibility study for all the corridors has been completed. It’s a low-cost, low-axle load, eco-friendly, electrically-propelled system with no pollution and low noise and vibrations; can negotiate sharp bends up to 25 metres, minimising need for property acquisition. Taking a step forward to strengthen the public transport in the Capital, the government is once again considering its earlier plan of building a light rail transit (LRT) system. Tokyo, Shanghai, Hong Kong and Kuala Lumpur that have an integrated multi-modal transit system. LRT lines are built in medium density areas, where heavy rails such as the Metro cannot be constructed. Tram system is a popular example of an LRT system that runs on a track, along with other traffic and serves as a feeder to metro and bus rapid transit. 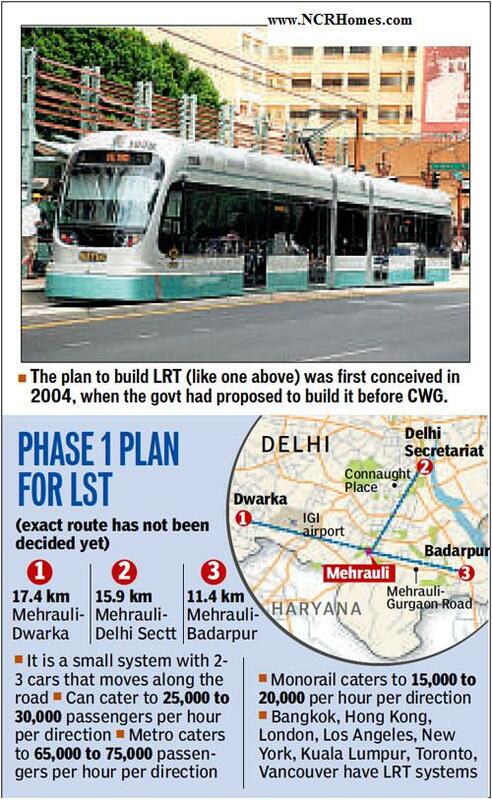 The Working Report 2011, released by Sheila Dikshit on Tuesday, on the completion of 13 years as chief minister, has mentioned LRT as Delhi government’s plan to “augment and strengthen” public transport infrastructure. In the first phase, the government has proposed to make Mehrauli in south Delhi as the LRT hub and run three lines connecting Badarpur, Dwarka and Delhi Secretariat with it. The 45-kilometre LRT network is likely to cost about Rs 7,000 crore. The plan to build LRT and monorail was first conceived in 2004, when the government had proposed to build three lines each of both systems before the Commonwealth Games. While monorail was planned as feeder to the Metro system, LRT was proposed as an effective and fast mode of transport for congested Walled city areas of the Capital. The Delhi government has already approved the proposal of constructing a monorail corridor between Shastri Park and Trilokpuri, while agreeing to build more monorail corridors where the Metro cannot reach. The transport department is also toying with the idea of building a 25-kilometre pod taxi track in south Delhi’s Vasant Kunj. 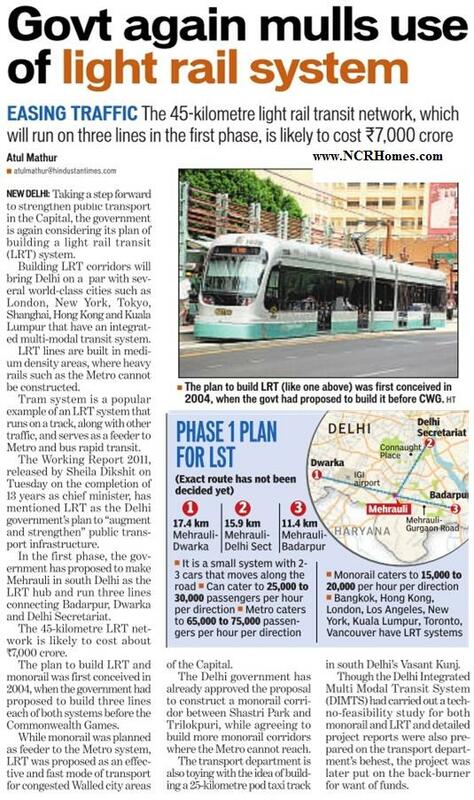 Though Delhi Integrated Multi Modal Transit System (DIMTS) had carried out a techno-feasibility study for both monorail and LRT and detailed project reports were also prepared on the transport department’s behest, the project was later put on the back-burner for want of funds.